Footballing legend and style icon David Beckham has had more than a few grooming looks through his quarter of a century in the spotlight. There was the boyband curtains, the iconic buzz cut, and let’s not forget the mohawk, the cornrows, the pompadour and every expertly crafted facial hair style in between – each look nailed like one of his sweet-as-a-coconut crosses. So when it was announced that Goldenballs was going to let mere mortals in on his bathroom secrets through his own grooming brand, House 99, we (along with men everywhere) were at fever pitch. Named after one of the most significant years in Beck’s evolution (he got married, won the treble with Manchester United and welcomed his first son Brooklyn in 1999), House 99 has been built to serve as a community for everyday guys to change, experiment, swap, share and of course level-up their looks, with the man who makes it all look so effortless by their side. In the brand’s first year, we named the miracle-working Brighter Eye Balm as the Best Secret Weapon in our Grooming Awards, while Beckham himself nabbed the Grooming Icon award (well, who else could it have been?). And if that wasn’t endorsement enough, all the products in the House 99 range are tested and approved by barbers. To make 2019 your most handsome yet, we’ve picked seven must-have hero products from the growing House 99 range and a further two ever-so-handy all-in-one sets. After all, Beckham has never stuck with one look, and neither should you. As an extra bonus, here’s an exclusive offer for FashionBeans readers: spend £35 and you’ll receive Smooth Back Pomade, Greater Look Face Moisturiser and Truly Brighter Eye Balm minis worth £27. Just use the code BEANSEXCLUSIVE at the checkout. Ever wondered how Mr Posh Spice steps out with top-notch tresses time and time again? It’s all down to this versatile Smooth Back Shaping Pomade, which was inspired by one of Beck’s go-to looks: the pompadour. Humidity and sweat-resistant, it provides just the right amount of hold to keep your hair in place throughout the day while allowing you to re-shape it whenever you please. If you’re a newcomer to the grooming game, building an entire bathroom arsenal from scratch can be a daunting prospect. Fortunately, there is an easy solution. The Change It Up Styling Kit contains everything you need to get ready for a night out (or a royal wedding) including a purifying and thickening shampoo, clay hair styler and complexion-enhancing moisturiser. As any man who has ever tried to grow a beard knows, there’s more to it than just letting wispy facial hair roam free (that’s if you want to look good, which of course you do). Let the House 99 Softer Touch Beard Oil be your wingman through the journey. Lightweight and non-greasy, it’s formulated with shea butter to keep hairs soft and itch-free while also doubling up as a pre-shave oil. Pollution, shaving, the weather – sometimes it can feel like your skin is being attacked from all angles. You needn’t make a deal with the devil to stave off the effects, though, just arm yourself with a quality moisturiser. Up the ante-oxidant with House 99’s Greater Look Face Moisturiser delicate balance of spirulina and quinoa extract along with face-saving vitamin E and salicylic acid, which have been specifically put together to protect your skin from free radicals, load it with hydration and prevent shine. When space is at a premium, such as in your gym bag or when travelling, 2-in-1 products that double-up on their duties are a grooming god-send. 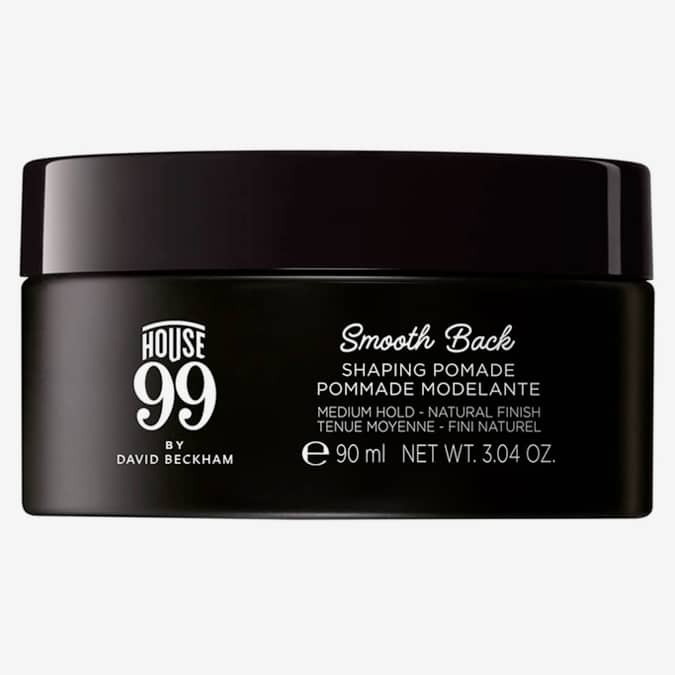 House 99’s Seriously Groomed Beard & Hair Balm works to tame unruly hair, whether it’s on your head or your face. The formula evens out and adds structure to facial hair while also serving as the perfect pre-styling aid for short to medium locks. In the UK and US, around a third of all adults have at least one tattoo on their body, and it’s fair to assume a decent amount of those will have been influenced by Beckham’s own body art. Of course, ink is only as good as the canvas it’s on, so step forward House 99’s Tattoo Body Moisturiser. Loaded with SPF 30, it helps maintain the colour and sharp lines by shielding against pesky UV rays that can cause fading. A good grooming regime doesn’t have to mean hours spent dollying yourself up in front of the mirror every morning. Keep yourself squeaky clean and on-time for work with House 99’s Greater Look Grooming Kit. It contains the three essentials for looking (and smelling) handsome: an intensely cooling body and hair wash, charcoal-enriched gel facial cleanser and nourishing anti-shine moisturiser. Instant upgrade, just add water.